If you or someone you know is a victim of a fraudulent scheme or crime, whether that person is an undocumented or documented immigrant, the Immigrant Affairs Unit can help. Brooklyn is home to one of the largest immigrant populations in the United States, and the second-largest immigrant population of the five boroughs. More than 30% of Brooklyn residents are foreign-born. Immigrants are essential to the cultural and economic life of Brooklyn neighborhood. Unfortunately, there are individuals who deliberately prey upon these communities. The Immigrant Affairs Unit investigates and prosecutes individuals and businesses that target and exploit immigrants through fraud. The Unit encourages both documented and undocumented immigrant victims and witnesses to cooperate with law enforcement without fear of immigration consequences, but in recent years, aggressive federal immigration enforcement—including in and around courthouses—has made this more difficult. The Immigrant Affairs hotline received nearly 150 calls for assistance in 2018—down more than 67% from the 457 calls the hotline received in 2016. The Office has even been forced to reduce or dismiss certain charges because witnesses were too afraid to cooperate with authorities. To counter these fears, District Attorney Gonzalez has called on Immigration and Customs Enforcement (ICE) to stop their misguided practice of conducting enforcement actions in and around our courthouses and to treat courts as sensitive locations. He also supports efforts by the state legislature to keep courthouses safe from ICE intrusion. Moreover, in 2018, the Unit certified approximately 200 U visas for noncitizens who were victims of crimes and provided assistance to law enforcement. Despite the climate of fear that federal policy has created in immigrant communities, when victims do come forward, the DA’s Office has succeeded in holding accountable those who prey on vulnerable immigrant New Yorkers. The Immigrant Affairs Unit is staffed with specially trained attorneys who come from diverse backgrounds themselves, and who have access to translation services. These attorneys have a successful track record of overcoming cultural differences and language barriers to establish trust and build successful cases. 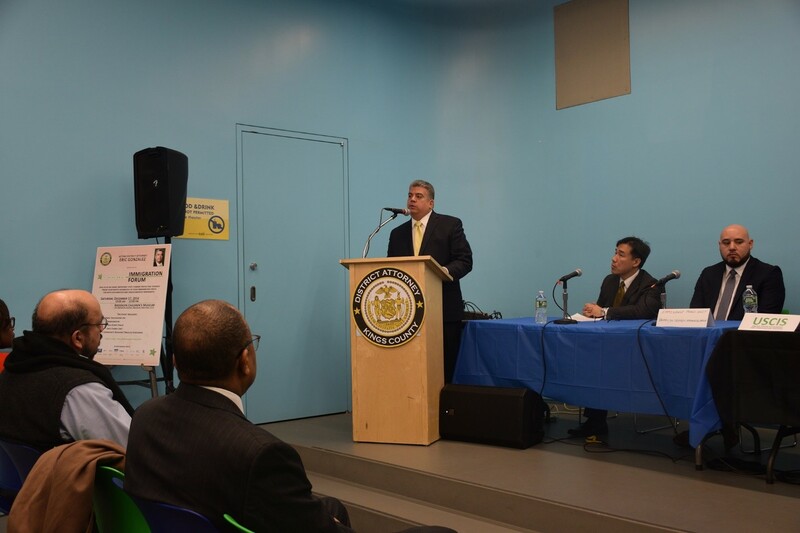 As part of a constant effort to reach out to and educate Brooklyn’s immigrants about their rights, members of the Immigrant Affairs Unit hosted an immigration forum and participated in more than 50 outreach events throughout Brooklyn in 2018. Contact us for more information about community outreach, fraud prevention education and referral services. To report immigrant fraud, call the Immigrant Affairs Helpline at 718-250-3333 or submit the Immigrant Fraud Complaint Form via email at IAU@brooklynda.org. Companies, organizations or individuals who falsely represent themselves as “attorneys,” “lawyers,” “notarios,” “immigration specialists” or “public officials” and they give legal advice or promise to process immigration paperwork. Individuals who falsely promise -for a fee- to sponsor work visas or to provide employment training. Individuals who pretend to be law enforcement agents, such as U.S. Immigration and Customs Enforcement (ICE) agents and say they can provide or obtain special treatment or services. Construction companies that hire immigrants but then do not pay them the salary required by law. Individuals who promise health care enrollment assistance but they do not provide such service.